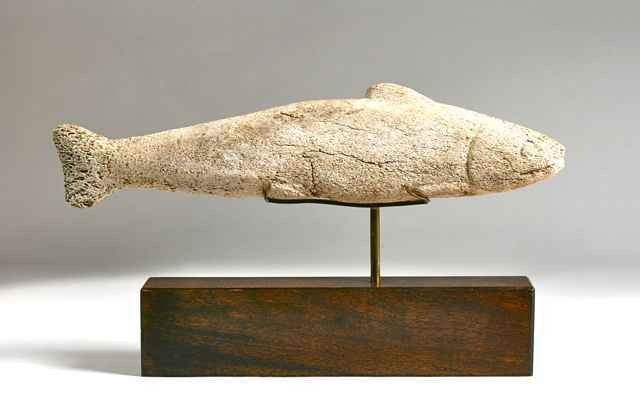 A rare Native American fish effigy representing a salmon, carved from whale bone, and dating to 18th to 19th century. Carved Whale Bone, heavily weathered/worn, with signs of much ethnographic use. Wood Base - 9" x 2" x 1.75"
Probably Tsimshian in origin, as they are known to use salmon effigies during ceremonies to welcome the salmon who arrive in their rivers during the spawning season. The Tsimshian have traditionally used whale bone for small ornaments and carvings. There is no collection history attached to this piece and so although it is attributed to Tsimshian on stylistic characteristics (see photo comparison below), there is a slight possibility that it could also be Haida or Tlingit. The salmon effigy is carved from a rough piece of whale bone and is simple in form. The features are simple and representative of the fish, without elaboration or added artistic detail, as ceremonial use only required an effigy to represent the salmon. The eyes are round, the mouth is carved realistically, and the gills are carved in low relief. The fins and the tail, as well as the general proportions of the salmon are realistic. This salmon effigy is quite old and has seen much ethnographic use. The carved, incised features have been worn down and there is some small loss to the bottom of the tail and on the top fin. The piece shows overall wear, light discoloration, and some small age fissures, especially towards the underside of the fish. This piece was obtained from an old San Francisco collection. A previous owner has had a beautiful wood and brass custom base made especially for the piece, and the stand is in very good condition, as shown. Northwest Coast tribal pieces that were used ethnographically are rare.